We provide the latest and most innovative Archery equipment. We are an authorized bow dealer for MATHEWS, MISSION, ElITE, BOWTECH, OBSESSION, and we also sell 10PT, CARBON XPRESS, EXCALIBER, and RAVIN crossbows. Our release lines include STAN, SCOTT, T.R.U. Ball, and Carter. Order customized arrows by the half and full dozen from manufacturers such as Victory, Gold Tip, and Easton. Our Master Technicians combine the use of the latest tools and techniques to set up and keep your equipment performing at its peak. Purchasing a new bow? Looking to properly tune your current bow? Are you looking for private lessons for children and adults? You came to the right place. By appoinment we dedicate that time to focusing on you and your needs. Call the store. Talk discuss your needs. Make the appointment. We'll get everything straight. We'll have you flinging arrows and Pounding "X's" in no time. 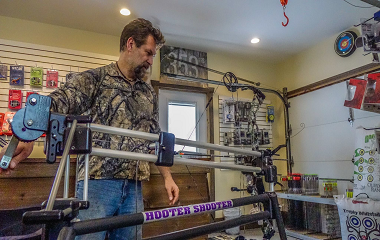 When you purchase a new Mathews, Mission, Elite, Obsession, or Bow Tech bow from Bob & AJ's Archery World we will dedicate the time to customize your purchase to fit all of your needs. Sights, strings, stabilizers, arrows, rests and releases all within your grasp to make every shot.. perfection. Do you love your current set up but need new cams, mods, bushings, or are you suffereing from stretched strings? No problem. We can do it all. Specializing in 10pt, Mission, Excaliber, and Ravin crossbows, we will have you shooting like a pro in no time. Already own a crossbow? Bring it in and let us make it better. Make an appointment to learn from the best. Learn the right way first, without having to retrain. We can address equipment and form issues that will have you shooting the center ring or restoring confidence in taking that shot. Gold Tip, Victory, Carbon Xpress, Easton - Your arrows matter! 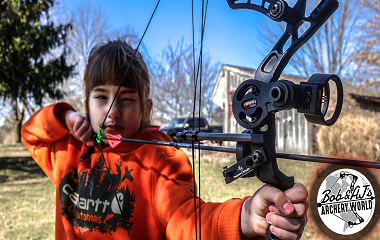 Having a fast bow means using the proper arrow and broad head. Rage, G5, Slick trick, Muzzy, mechanical or fixed. It is all about the correct spine for your arrow and forward of center.